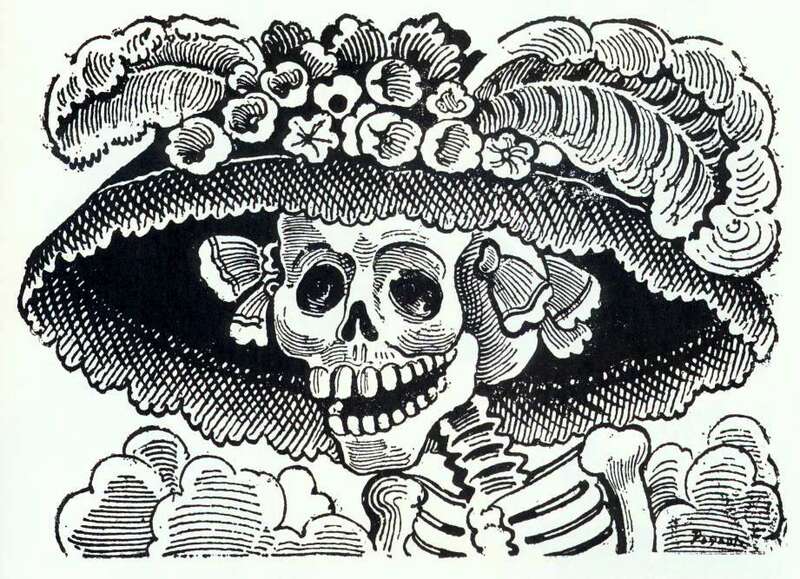 ¡ Felíz Día de los Muertos ! The Day of the Dead (Día de los Muertos) is a gathering to pray for and remember friends and family members who have died. 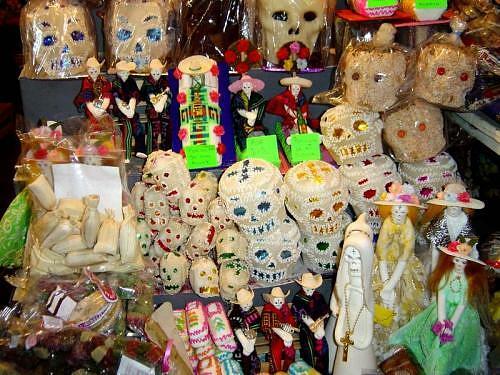 In Mexico it is a national holiday (November 1st and 2nd) in connection with the Catholic holidays of All Saints’ Day and All Souls’ Day. 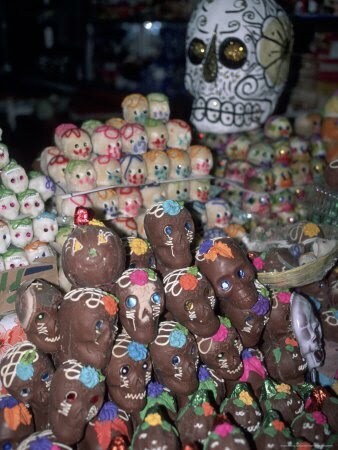 Traditions include building altars honoring the deceased using sugar skulls, marigolds and the favorite foods and beverages of the departed, and visiting graves with these as gifts. 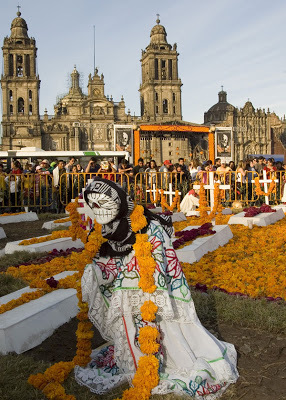 The festival originally fell in the ninth month of the Aztec calendar -about the beginning of August- and was celebrated for an entire month. The festivities were dedicated to the goddess Mictecacihuatl. In most regions of Mexico November 1 honors children and infants, whereas deceased adults are honored on November 2. This is indicated by generally referring to November 1 mainly as Día de los Inocentes (“Day of the Innocents”) or Día de los Angelitos (“Day of the Little Angels”) and November 2 as Día de los Muertos. 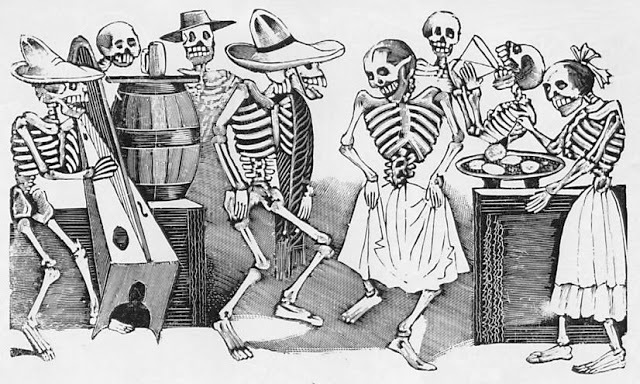 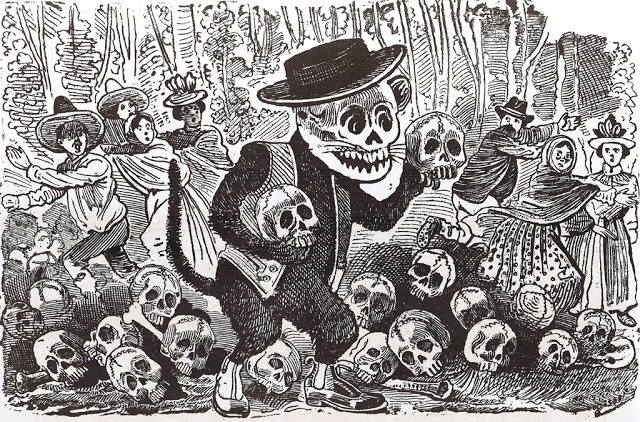 Jose Guadalupe Posada: (1852–1913) was a Mexican cartoonist, illustrator and artist born in Aguascalientes. 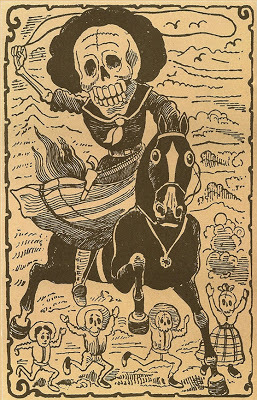 His received an education from his older brother Cirilo, a country schoolteacher, and went to work as a teenager for Trinidad Pedroso who taught him lithography and engraving. 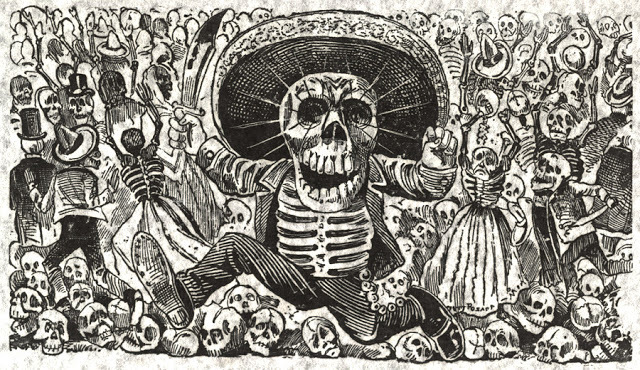 In 1871 he took a job as the political cartoonist for a local newspaper which soon closed, reputedly because one of Posada’s cartoons had offended a powerful local politician. 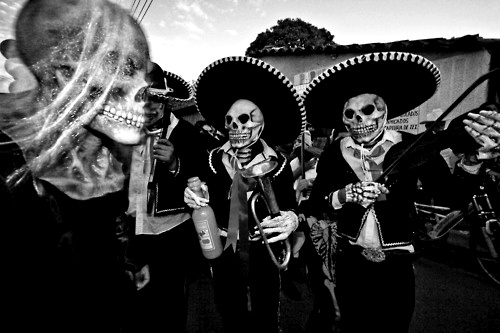 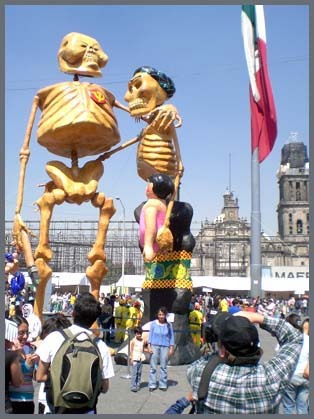 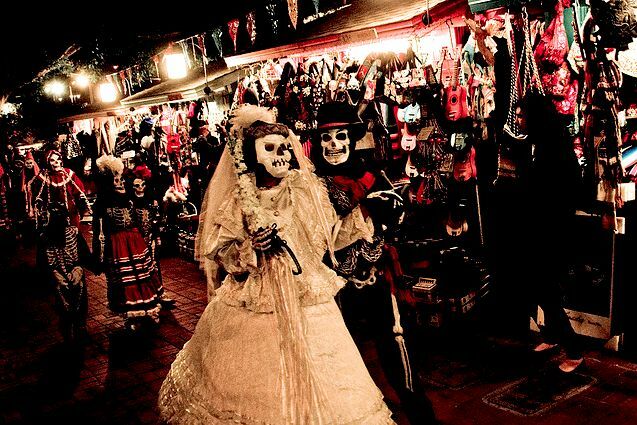 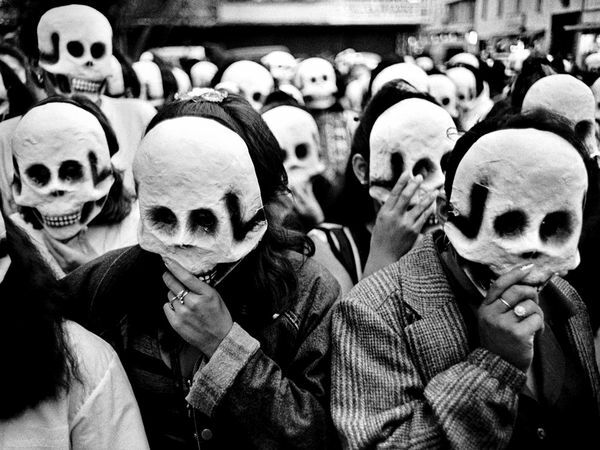 images have become associated with Día de los Muertos. 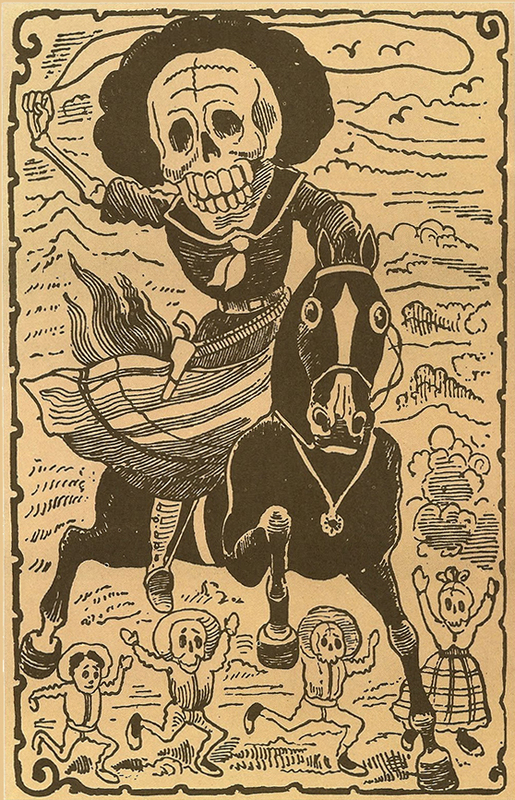 Largely forgotten by the end of his life, Posada’s engravings were brought to a wider audience in the 1920s by the French artist Jean Charlot, who encountered them while visiting Diego Rivera. While Posada died in poverty, his images are well known today as examples of folk art. Santa Muerte, also known as Santisima Muerte, literally translates to “Holy Death” or “Saint Death.” She generally appears as a skeletal figure, clad in a long robe and carrying a scythe and a globe. 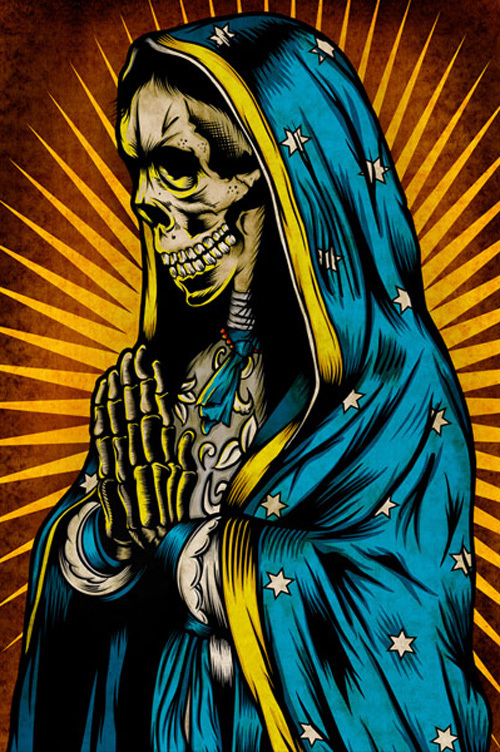 deliver them from poverty. 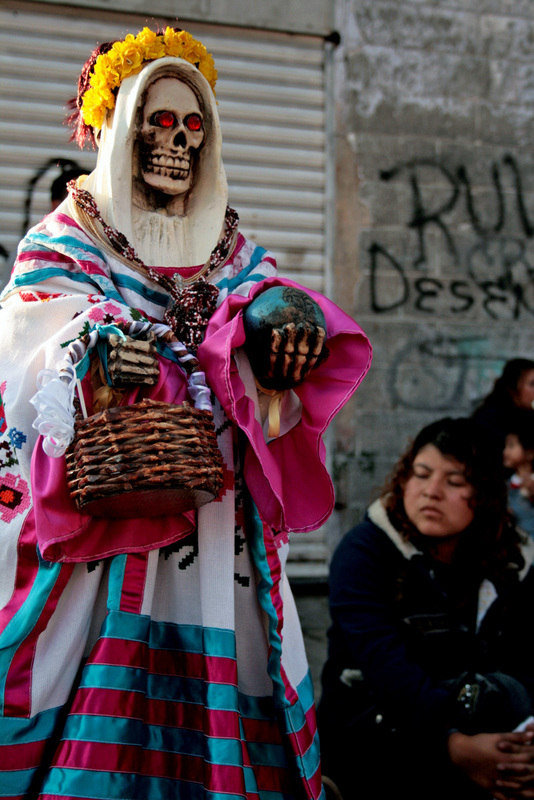 The Catholic church has stated that some groups have begun revering Santa Muerte more than Jesus Christ and declared it a cult. 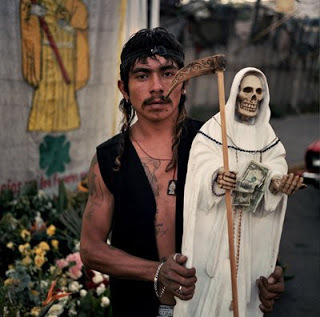 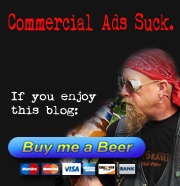 Many followers of Santa Muerte live on the margin of the law or outside it entirely, and the church has strongly emphasized the connection between Santa Muerte and criminal gangs.